Please return your fall semester college textbooks by Wednesday, January 23rd. Students dismissed 1:45 PM Friday, January 18th. The Latina Public Service Academy provides government and public policy training and instruction to high school Latinas. 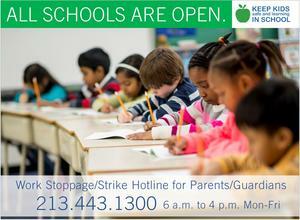 ECA will be following our regular schedule during the teacher strike. See the attachments for number and times! Early College Academy @ LATTC will be open and operating on a regular schedule during any strike/work stoppage. Winter 2018 GATE/SAS Parent Newsletter (in English/Spanish). The Gifted and Talented Newsletter is attached. The California Department of Education (CDE) and the State Board of Education (SBE) today launched the second version of the California School Dashboard, a website that gives parents, students and educators access to valuable school and district data. Early College Academy @ LATTC School Site Council will be meeting Tuesday, November 27th 3:30 PM in Sage Hall Room H353.